Hermit Falls is one of the most popular hiking destinations in Southern California – a beautiful trail takes the hiker through the lower reaches of Santa Anita Canyon to the top of 30-foot tall Hermit Falls, where you can reliably find cliff-jumpers, swimmers, (and unfortunately, taggers) on warm weekends throughout the year. 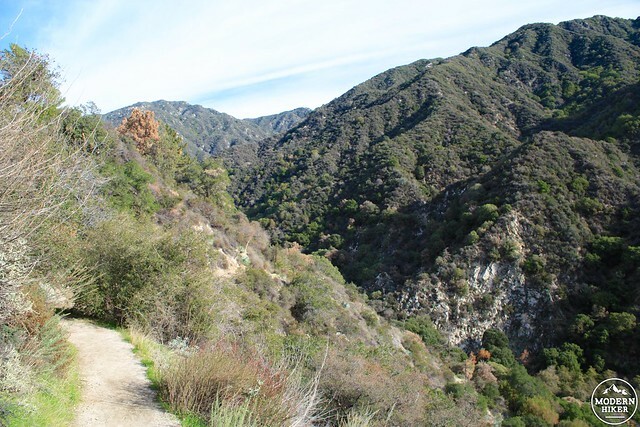 The trail itself is right next to our very popular and highly-recommended Santa Anita Canyon loop and for experienced and energetic hikers it’s easy to combine both routes into one trip – or at the very least visit both Hermit and nearby Sturtevant Falls for a wonderful day hiking experience. 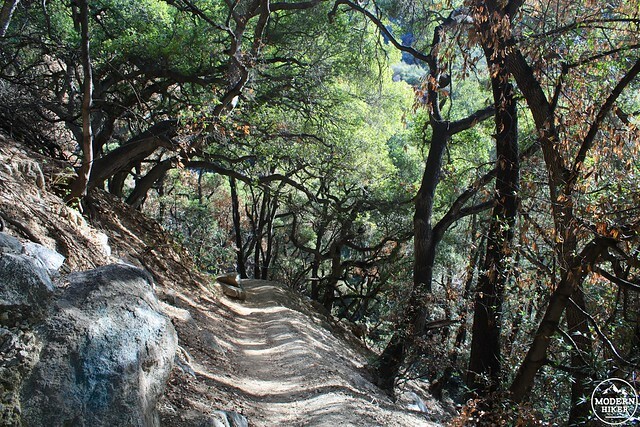 This route begins at the often crowded and more-often overcrowded Chantry Flats parking area. If you are hiking this on a weekend be sure to get here as early as possible to avoid having to add miles of hiking along the road to your trip. The nearby Adams’ Pack Station offers some spillover parking in a private lot, but there’s an additional cost ($10 at the time of writing). 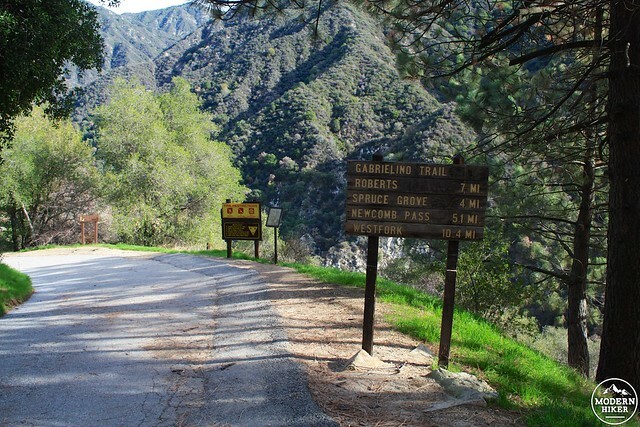 Once you’ve secured your parking spot and displayed your Adventure Pass, head down into Santa Anita Canyon along the same road you’d take to get to Sturtevant Falls. You’ll walk on the descending paved road for about 0.2 miles before a sign at a switchback in the road marks the junction with the Hermit Falls Trail. 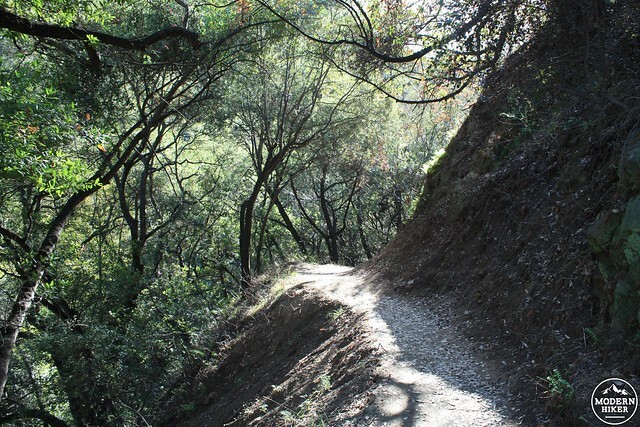 You can also use this as a slightly longer descent toward Sturtevant Falls. It will add a bit of distance to your overall hike but the scenery is significantly nicer – not to mention less crowded. After the first quarter mile, the trail hangs a sharp switchback, providing you with lovely views looking north in Santa Anita Canyon. 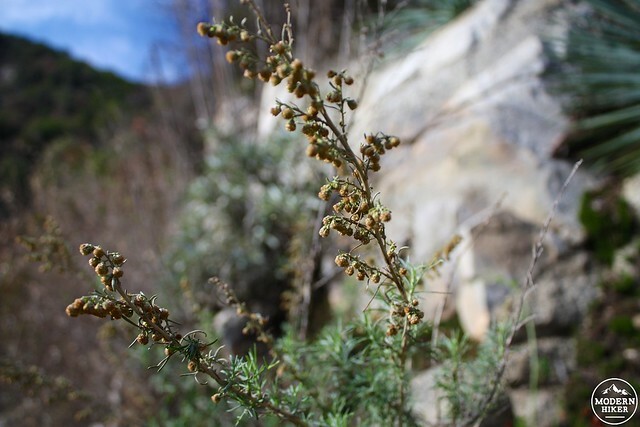 A flowering California sagebrush – sometimes called Cowboy Cologne. As you get closer to the bottom of Santa Anita Canyon, the trees become larger and more majestic and the canopy becomes much more dense. You will truly feel worlds away from the sprawl you were driving through not 40 minutes prior. 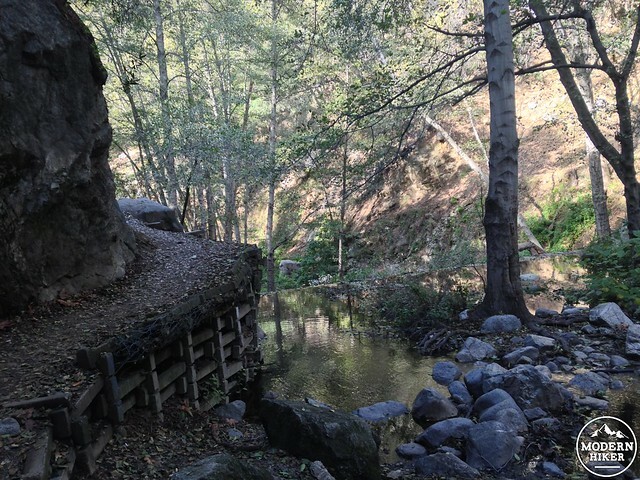 At the 0.75 mile mark, the trail makes a quick turn to avoid stomping through the backyards of the historic cabins and heads down toward Santa Anita Creek. A use-trail looks like it continues down the canyon with the flow of water on its western bank, but the actual trail is on the other side. Boulder hop to the east bank and you’ll find the trail right away as it rises above and over one of the many flood control dams in the canyon. For the next half mile, the trail trends downward following the canyon and occasionally hopping across the creek. 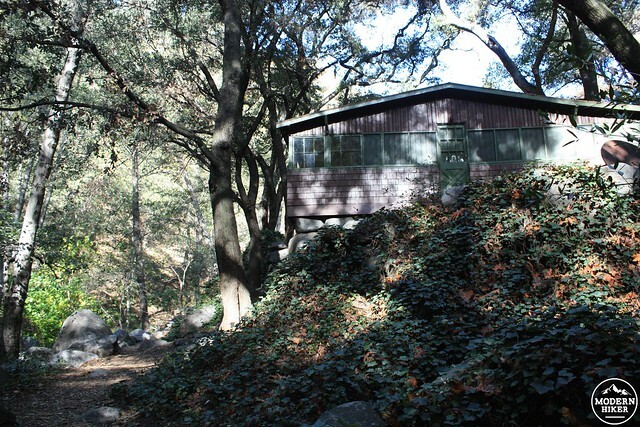 There aren’t quite as many historic cabins in this stretch of Santa Anita Canyon as there are in the upper reaches, but you’ll still pass a few extremely idyllic-looking homesteads along the way. 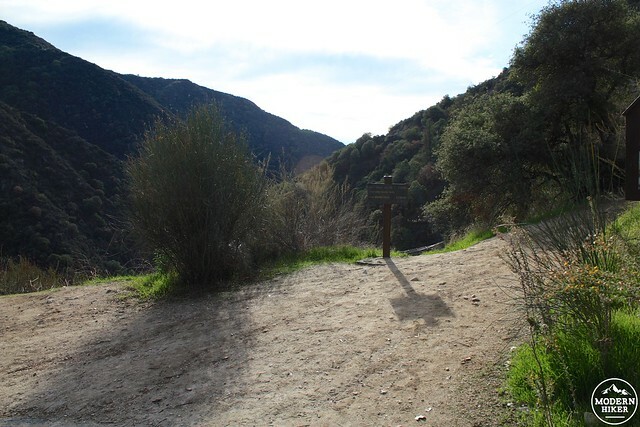 Finally, at the 1.3 mile mark, the trail hugs a narrow ledge on the canyon’s side and approaches the top of Hermit Falls. Depending on the water levels, you may be able to hear the water rushing down its granite face before you can see it. Hermit Falls is very similar to Sturtevant Falls in that the water flows through a few smaller pools before making its big cascade. If you’re not up for a jump but still want to cool off, there are two perfectly-sized swimming holes right above the fall that are great places to cool off in the summer. Unlike Sturtevant, however, people actually jump off of this waterfall into the larger pool at its base. And unfortunately, because this area isn’t quite as well-trafficked as Sturtevant, there is a lot of graffiti and vandalism in the area. You can tell that crews do get in here to clean up this vandalism every once in a while, but their efforts largely go undone. Many in Southern California had hoped that the new San Gabriel National Monument would increase funding for maintenance and ranger enforcement in heavily used areas like this, but for some reason Santa Anita Canyon was left out of the declared Monument and remains in the Angeles National Forest. There are still efforts in the Legislative Branch to expand the protected area with secured funding, but no one expects movement on that anytime soon. The official trail ends here, but there are several use-trails and scrambles leading to the pool at the base of the falls which you can traverse at your own risk. Most of these routes have been worn into place by jumpers making their way back to the top of the falls. It should also go without saying that jumping off this waterfall can be extremely dangerous. 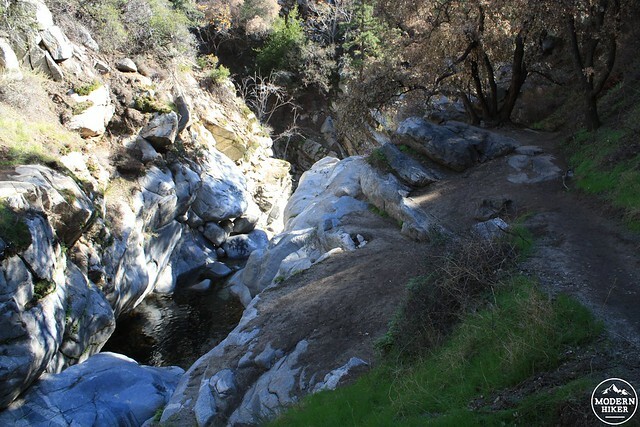 Most jumpers can enjoy this without incident, but there have been several injuries and even deaths at Hermit Falls over the years – with average annual rescue calls in the double-digits. If you are planning on jumping, be sure to check the water levels at the base – especially considering the increasingly frequent droughts we are suffering. Also, definitely take into account the time of year — after our rainy season in winter and spring, assuming we’ve had a good amount of rainfall, there may be plenty of water in the lower pools. Later on in the summer and especially in the fall, it’s best to just enjoy the view from above. Even if you don’t jump, the Falls are a nice location to visit – graffiti notwithstanding. 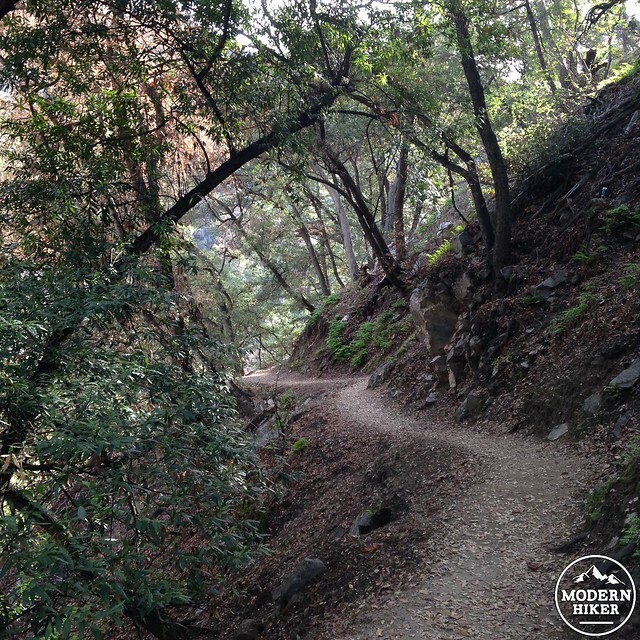 Head back out the way you came in, or consider hiking along the canyon floor to tackle some or all of the larger Santa Anita Canyon loop. 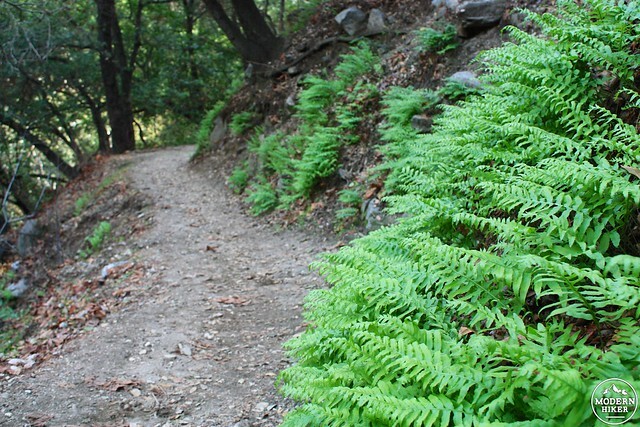 The trail along the canyon floor is fairly short and will put you onto the main Santa Anita Canyon Trail near the Roberts Camp site. The trail is very well-traveled and well-maintained. 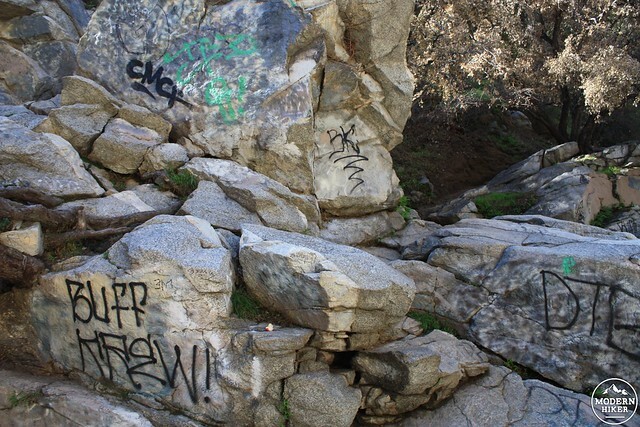 If you want to scramble down to the base of Hermit Falls, that will be at your own risk and effort on unofficial use-trails. 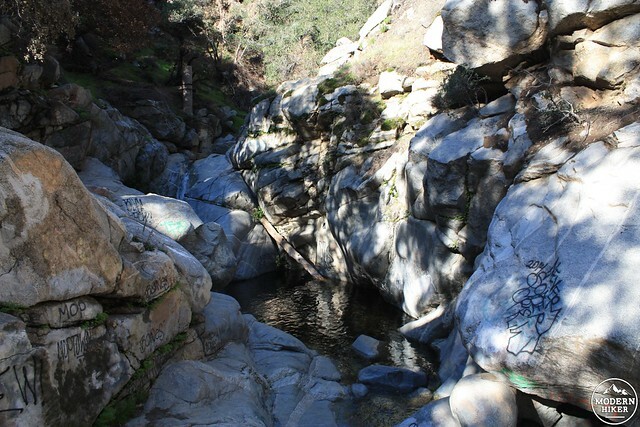 There are several free walk-in campgrounds along the Santa Anita Canyon trails for backpackers. Cabins at Camp Sturtevant are also available for rental - and you can also have your gear trekked in on mule train for an additional fee. Visit the Adams' Pack Station web site for more information. Take the Santa Anita exit from the 210 toward Acadia. Keep on Santa Anita Canyon Road until it ends at Chantry Flats. If you can find a parking spot here, snag it and display your Adventure Pass. The Pack Station has overflow parking, but you’ll have to pay ten bucks - even if you’ve already got a pass. Hermit Falls is a short trail. But what actually made it intense and exciting were the extreme change of nature once at the bottom of the mountain, the dangerous shortcuts, and the small "village" by the falls. It was like entering to Agharta, the inner world. Also, it's a non-difficult descend and ascend. Very easy trail. Perfect for those who like to have a walk and just enjoy the day by the safe way.